The Moon says – aim to evoke a conscious desire to go further than intelligence – the understanding of that which is and decide to make a “leap” into pure and simply creativity. Intuition of faith – participation in the becoming of what is to be. Bring inner ecstasy back into your consciousness. Allow your intuitive powers to guide you – the change has come, even though it does not show. Make notes of your dreams and intuitive feelings – be more independent now and trust your own feelings. Build your own security – clear the air and let others know where you stand. Without faith you can easily succumb to failure because there is nothing to support your goals and ideals in life. Spontaneous knowledge is the marriage of your intelligence and your wisdom, united by “grace” – the knowledge of God. It is the vow of “poverty” made by your intelligence to reduce itself to silence in order to listen – it is your vow of “love”. Your unconscious, instead of shocking your intelligence – allies itself with it. In the beginning, your unconscious and your intelligence have so little in common that communication is entirely through “dreams” – the state of consciousness where intelligence remains passive. This communication is extended to the waking state and finally, no longer unconscious – your intelligence and wisdom unite in the conscious state of “intuition”. Organization and sleep are the keys. During sleep – waste is eliminated and your hopes and wishes are built. There is great activity and intense emotion now – your subconscious is actively creating sensitivity – be alert to any possible deception. Never use your powers negatively – go deep within and seek peace. Your dream landscape is formed by your emotions – use this unconscious state for your conscious purpose – it is an efficient, natural therapy in which your physical body-building takes place. Here you work out your own destiny, by exploring probable actions – which become false when not actualized. Move through the distortions and fears into the light of truth. Be changeable, allow yourself to “flow” with the different phases of life. Your “conscience” is the direct communication between your intelligence and higher wisdom. Conscience manifests as a “warning” – expressing disapproval of an action before it is executed and remorse for an action already committed. Conscience also manifests itself as an “impulse” – recommending an action before it is executed and producing serene joy after execution. Conscience is the door to an “inner” world far more profound than the world you perceive with your senses – it is the decision of your intelligence to become a servant of your conscience. Complete “silence” of your intelligence, imagination and will can not be accomplished by your human will – it is accomplished only through Divine presence. It is the mutual love between the soul and God. “Knowing better” is the state of consciousness which is present once you have reviewed all your total efforts and the results obtained from those efforts. Recognize now that you are only playing around on the surface of things – behind the surface is a tremendous organization that is very much alive and “active” and you are allowed to participate in your dreams and meditations. What you wish to be is your responsibility – an artist must concentrate. You must decide what it is you want to be and then your meditation will help you discover what is and what is not true about yourself, for it puts you in touch with your Innermost Self – which is your guide. Your imagination – once accepted, enriches your life and allows a calming peace to emerge. Look deeply into yourself – your imagination can distort – it is a reflection of your “inner” experience into the outer world. Remember your dreams and you will KNOW your past which will assist you in understanding your present. Once you have mastered something, you no longer “think” about it, you just respond automatically. Is something from the past – something you have forgotten – still effecting your current situation and causing you to respond with actions that are inappropriate? You can not explain “art” by examining the material used to create it. You will soon learn to laugh again – because the difference between your limited “ego” self and your “true” Self is so ridiculous. Once you have traveled the path and obtained wisdom and understanding – you will know precisely what to do with yourself and you will proceed to do it. If you are brave enough to hang on to your dream for yourself – it will manifest as your subconscious makes the necessary physical changes during your “sleep” state – while your waking mind is out of the way. Become neutral – flow with what pulls you – give your inner, secret goal some attention every single day and your mind will respond as you continue to repeat your desires for happiness and joy. Grown up emotions, capable of intelligent love and compassion as the self begins to merge with the other. Passions that are intricately and harmoniously woven into the overall fabric of the lifestyle and life’s purpose. Floodgates to work in concert with the ebb and flow of the Moon’s attractiveness. Your mature emotions help equip you for the journey of your expanded sense of Self, the Self that has begun to feel as one with its environment and nature, the Self that will feel the larger joys and larger pains brought to it by its larger heart. This can indicate a sense of emotional mission. A dedicated humanitarian. Altruism. The Moon is the cool, silver, reflective mirror of the Sun. It gives us the ability to see ourselves and our effect on the selves of others. Here are the inner goals to match the outer goals shown by the Star. The person who has deep compassion is not going to be bothered whether he tells a lie or the truth. All Buddhist have lied – they have to because they are so compassionate. The whole truth will be too much. What do your fears represent to you? What is bewildering or confusing you? What is real and what is illusion? In the first position: This is a lifetime for love, for hands-on sensory experience of people and the environment, of animals and nature. You are interested in virtually everything in one way or another. But this is a blending of passion within compassion. The motivation here is one of deep caring. In the second position: Yours is a highly creative, sensitive lifestyle. You are living your principles and there is a natural flow and ease in your environment which is a healthy extension of your personality. When you come home, you can relax and refuel. In the third position: Paying attention to others and their needs, acting out of love, should be part of daily life. Do not wait to be moved; move yourself. When you give, give wisely and within your means. To give more, work to increase your means. In the fourth position: Here is a love of love, a very mature emotion at such an early age. It is the spark of innocent, open – hearted longing for the world at large that grows into universal love in the mature heart. Many feel something like this when they are young only to lose it and have to rediscover it again. Your spark has grown into the full flame that burns in your heart to this day. In the fifth position: Your mind is occupied with the heavy work of your heart; it is so full of love and compassion. The wheels are turning for ways to use the energy generated by the rapid flow of blood through your veins. Passion harnessed to compassion is the stuff of creative genius that benefits all of mankind. In the sixth position: Here comes the test of integrating the deeper, the higher emotions into your existing relationships and creative work. This is not the same stuff you have known so far. This is a softer and sweeter candy than you have ever tasted. And it is harder and more bitter. Your soul is heeding the call of more and more members of your group. In the seventh position: Here is the mental test of maintaining a steady pace on a sure footed path as your heart increases its emotional commitments. In the eighth position: The thoughts of the mind and the feelings of the heart are combined in the immediacy of your surroundings. The physical reality of the power of higher emotions is yours for the having. This is ultra sensitivity. In the ninth position: The heart has discovered how to combine compassion and passion, how to offer life’s blood to save others without sacrificing self. In such moments as this when the transfusion of give and take is simultaneous, something new is brought to life. This is the miracle of creativity. 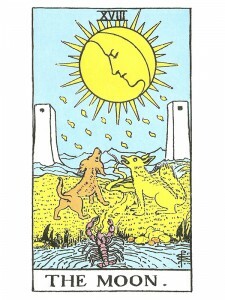 In the tenth position: Look at the next full moon and do exactly as it tells you. This is a time for letting go. Without thinking whether your actions are for yourself or for someone else, just act and react as events unfold, without premeditation, but with honesty. The magic of the moon will weave passion and compassion into one continuous silver thread of reward. I’ve come to your site so many times. I’ve gotten this one so many times, this last moon created some serious shifts in my life. The words have never rang truer. As a creative it’s so hard to prioritize the sleep, trust that the creativity will keep flowing, and keep diving for pearls in dreams. The good news is that my outcome is the 2 of Cups, yay!